Marissa's Well-Being and Health, 9780692662403, 252pp. Are you tired of fad diets and all-juice cleanses? Confused about all the conflicting nutrition information available? Over feeling guilty for your nutrition slip-ups? Finally learn to trust yourself to make slimming, nutritious and energizing choices without dieting, confusion and self-judgment Award-winning Health Coach and Women's Lifestyle Expert, Marissa Vicario, wasn't always as healthy and happy as she is today. There was a time when her diet had more macaroni and cheese and G&T's than broccoli and green smoothies. It wasn't until she hit rock bottom that she realized something had to change, and it was in that moment that she vowed to make her physical, mental and emotional well -being a top priority. 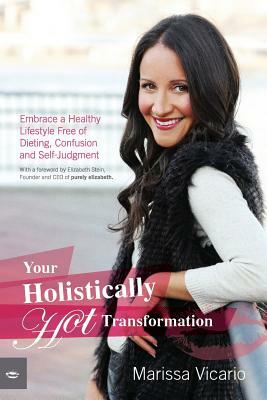 Your Holistically Hot Transformation follows Marissa's wellness journey from unfulfilled corporate professional to purpose-driven women's lifestyle aficionado committed to making healthy, fit and balanced (aka Hot), less intimidating, more approachable and totally attainable to women regardless of where they are on their own path to a healthy lifestyle. You'll find advice for making healthy living a habit, tips for stocking a healthy kitchen, guidelines for understanding the hunger and fullness cues your body sends you, simple ideas for self-care you've never tried before and a sprinkling of fast, fool-proof recipes and motivational mantras. Marissa Vicario, AADP, is an award-winning, board-certified Integrative Health and Nutrition Coach, healthy living blogger and Women's Health & Lifestyle Expert. As the Founder of Marissa's Well-being and Health, she is passionate about teaching women to trust themselves to make nutritious, slimming and energizing choices without resorting to fad diets and all-juice cleanses. Her tips, recipes and expertise have been featured on The Dr. Oz Show, The New York Times, Entrepreneur Magazine, Glamour and Next Generation TV among many other women's lifestyle publications. After spending a decade and a half as a junk food vegetarian and raging sugar addict, Marissa Vicario discovered whole foods and the way they made her look and feel. Her desire to live a cleaner, healthier lifestyle was so strong, she broke out her hand-me-down pots and pans and dull cutting knives and taught herself to cook in the kitchen of her Manhattan studio apartment. In the process, she learned that food changes everything and single-handedly transformed the trajectory of her life from the inside out. It wasn't long before she decided to study holistic nutrition and make it a career. When she's not teaching workshops and cooking classes or coaching clients in her private or group programs, you can find her traveling with her husband, David, running with the New York Road Runners or experimenting with flavorful, healthy recipes.